The main windows contain the proxy list and the details (speed, anonymity, gateway, ssl, danger, country and codeen feature) of them. If you double click a proxy to set it as active proxy for your browser (IE or Firefox), it will be shown in the lower-left table. 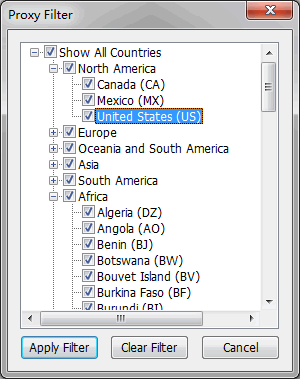 In this dialog you can choose the countries you are interested. Elite Proxy Switcher will only show the socks proxies in those countries that you are checked. Elite Proxy Switcher tests the proxies faster if the Max Thread is bigger but it will make your surfing slow if the number is too big. We recommend using the default value (5 for XP, 20 for Win7). The proxyjudge (what's proxyjudge) is used to classify the proxies. Elite Proxy Switcher will update the proxyjudge automatically if the current one dies so you need not to change it. In the test items box, you can choose whether to test the speed, anonymity, gateway, ssl, danger, country and codeen feature of the proxies. In the dialog you can easily select what type of proxies you want to export. It's also very convenient if you want to post your proxies in forums. 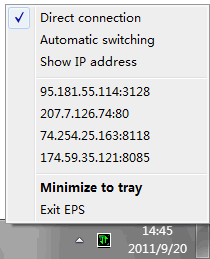 Right click some proxy in the Elite Proxy Switcher main window and check Enable for auto swithing, then you can see the proxy in the tray menu. You can use the tray menu to switch proxy quickly. In order to generate the serial number for professional edition, you may be asked to submit your EPS Computer ID in this dialog that is bound with your hardware, which can be invoked by clicking EPS menu Help->About. 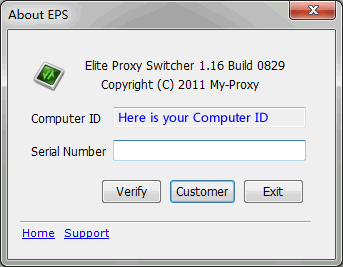 Elite Proxy Switcher supports Firefox. It will install an extension for your Firefox, so that it can automatically change the proxy settings for your Firefox. 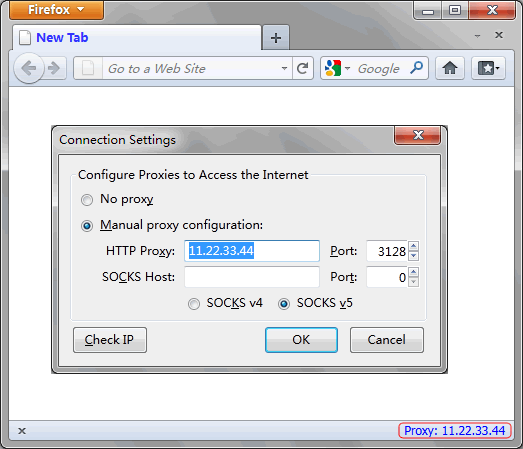 The active proxy is shown on the right bottom of Firefox.